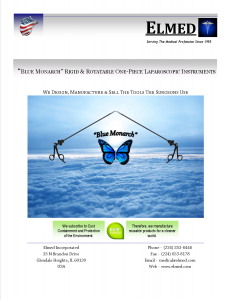 This PDF features our “Blue Monarch” 5mm Rigid One-Piece Instrument (Style A) and our 5mm Rotatable One-Piece Instrument (Style B). Both have flush ports for easy cleaning and are available with any of our handle styles. Please click on the PDF Icon for more information.